When it comes to feeding my babies, I'm a little bit...hmm, shall we say particular? I firmly believe that breast milk should be the prime source of nutrition through the first year and that solids should be put off until baby is ready (at LEAST 6 months)...and once baby finally does start eating 'real food', I'm just as particular...I want to be sure she is getting the absolute best options out there. Most of the time, I make her food myself (steamed fresh veggies and fruits), but when it comes to snacks, I wanted to have a few more convenient options that I could trust. When I went shopping to find some healthy, tasty options I was surprised to find that finding a good baby snack was not as easy as anticipated. Artificial ingredients- flavoring and dyes? For a BABY? No thank you! So, we looked into the organic options and found most still contained allergens like gluten and soy. With my children being at a higher risk for food allergies (due to my own as a child) and Finley already showing tendencies towards food sensitivities, these are ingredients we want to avoid for now. Happy Baby Happy Puffs were the only we personally found that did not contain either of these ingredients (no corn either), so it seemed like a great choice for us! I was beyond excited when they agreed to send a few coupons so that we could try out a variety of their products. We were already a fan of the Puffs, and could not wait to try out the rest! 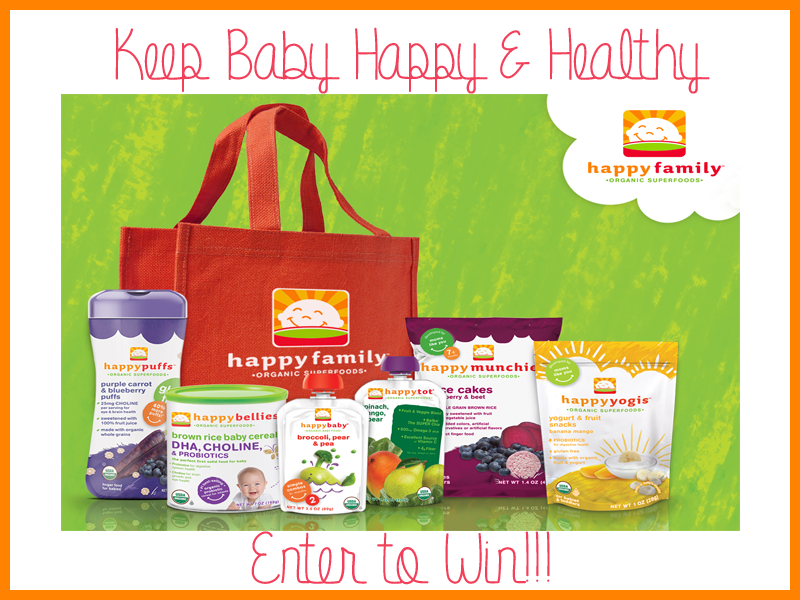 Like the Puffs, we found the ingredients in all the Happy Baby products to be just what we were looking for! No artificial flavors or preservatives or added colors. No GMOs. All organic, and made with whole grains. Even the packaging is made without the use of BPA and the Puffs packaging is even recycle-able. (Personally, I found it to be great to save for plastic shopping bags that we save for bathroom trash!) It is truly a food I could be comfortable feeding my daughter for those times when I'm not able to prepare her foods/snacks myself. How did she like them? Simply put, she adored them! The Puffs are perhaps her favorite- so easy to pick up and eat, and great for on the go as well. She has tried several varieties and has enjoyed them all. While we don't usually go for purees, the baby food pouches are perfect for tossing into the diaper bag when traveling with baby. I also loved the fun variety of flavors available...Pumpkin,apple, peach and cinnamon or apple, spinach and kale? Sounds better than the typical baby food varieties, right? The Munchies are another favorite here. The rice cakes are perfect for little hands, and Finley seems to eat them right up!! Unfortunately our store only had strawberry yogis, and being that I myself am quite allergic to strawberries, this is another ingredient we avoid (especially while breastfeeding!) We will be passing these along, in addition to the baby cereal coupons as well. I am sure BOTH products are great, just nothing we personally need! These are only a small variety of the great products available from Happy Family...and it's NOT just for babies! They have options for toddlers, kids and even adults. You can find out more (including local retailers) at the links below! You can even shop online, if you don't have a retailer near you! The yogurt drops and puffs! Thanks! Both the puffs and the rice cakes sound like they'd be convenient and good for my baby. The rice cakes sound good!! I would love to have her try the Happy Yogis. I am excited to let my baby try the puffs and the yogurt bites! I would love to have the grandbaby try the Happy Puffs.